Recycled plastic bollards are suitable for light and medium duty marker usage. The grained outer appearance makes them a durable alternative to timber bollards in parks, rural environments and landscaped sights. Constructed of recycled plastic from 100% mixed post-consumer waste. 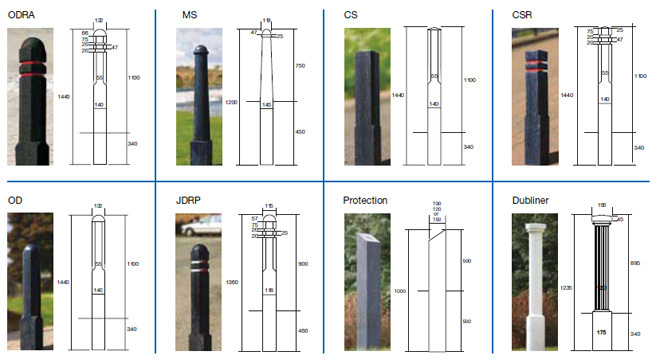 Unless otherwise stated, G&G bollards require a minimum below ground depth of 450mm to 500mm and 400mm square. Setting in concrete to a strength of 23Kn is preferred. Positioning pegs are available for keying into the concrete where bolloards are supplied with a pre-drilled hole located approximately 200mm up from the base.